When the PVA has all dried you need to undercoat the model you have built. You can use black, white or grey paint for this. Spray primer works really well. However if you are doing it manually mix a little PVA (1 part PVA to four parts paint) with the paint to help seal it in. The purpose of the undercoat stage is to cover up all the newsprint and get a solid base coat that you can decorate. 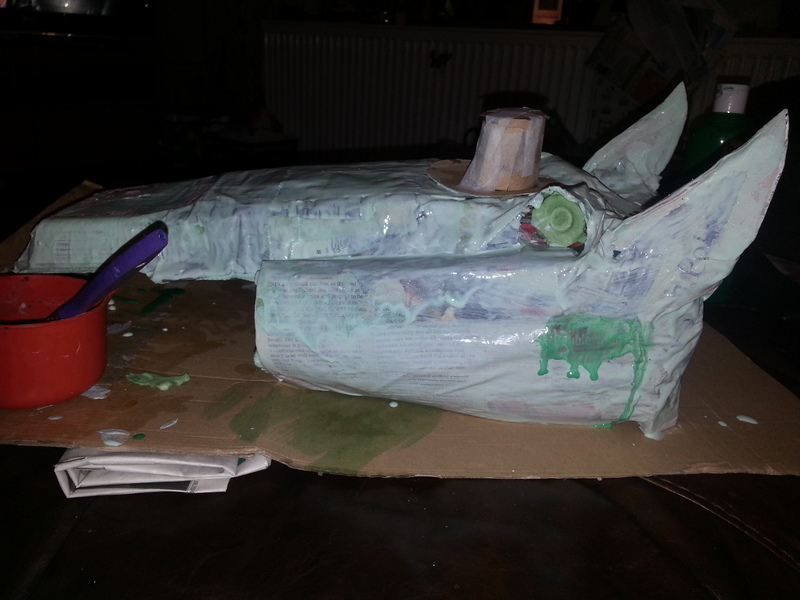 In the end we used white paint (with a small amount of green in it as we intended to have a green dragon). You might need to do more than one undercoat to get an even coverage. We needed two coats before the text from the newsprint wasn’t easily visible. When the undercoat has dried you can paint the dragon’s head. We chose to paint it glittery green as you can see from the picture below. As with the base coat mix a little PVA in with the paint. This will come in useful when you are doing the scales. The scales need to start at the bottom and work round the whole model. We made the scales using coloured paper, first cutting it into two inch strips and then cutting those into rectangles about three inches long. We did these with the big hefty kitchen scissors five sheets at a time. Once the rectangles had been cut out we then rounded the edges off on one of the shorter sides. The bottom couple of rows got taped on before the paint was done, but the top rows were stuck on using the paint as a glue. Each scale needs to overlap its neighbour and get stuck down at the top so that it ruffles slightly. The next row up needs to be offset from the one below and also positioned so that it covers up the tape (or the glued area). Keep going until you’ve got coverage. 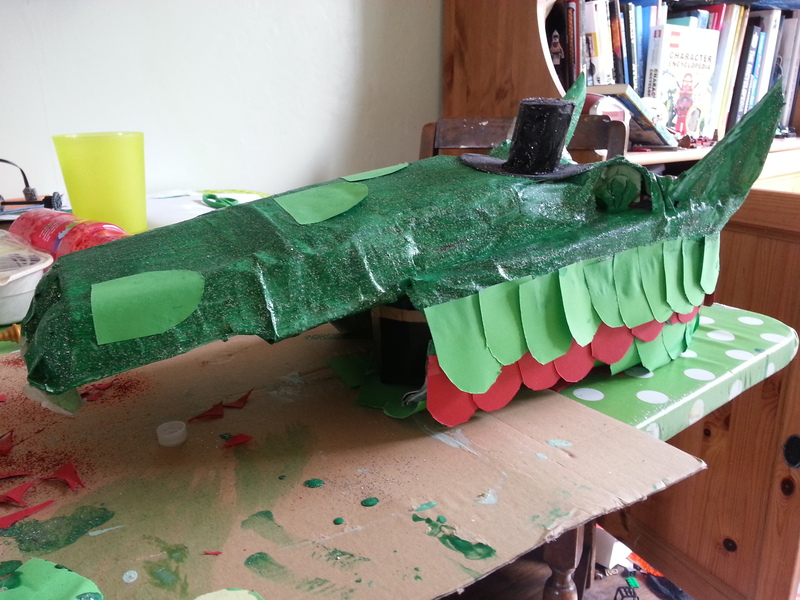 Alexander also decided to add a few extra scales on the snout. We also randomly put in differently coloured scales in places (you can’t see any in the photo below, but that is it still as a work in progress rather than the finished article). With hindsight I’d probably have done this step differently, however the lower jaw was made without adult supervision and I had to stick it on without modification. Alexander used an egg box for six eggs, he used the two middle pieces in the bottom of the box to make the teeth and used the lid as the bottom of the jaw. 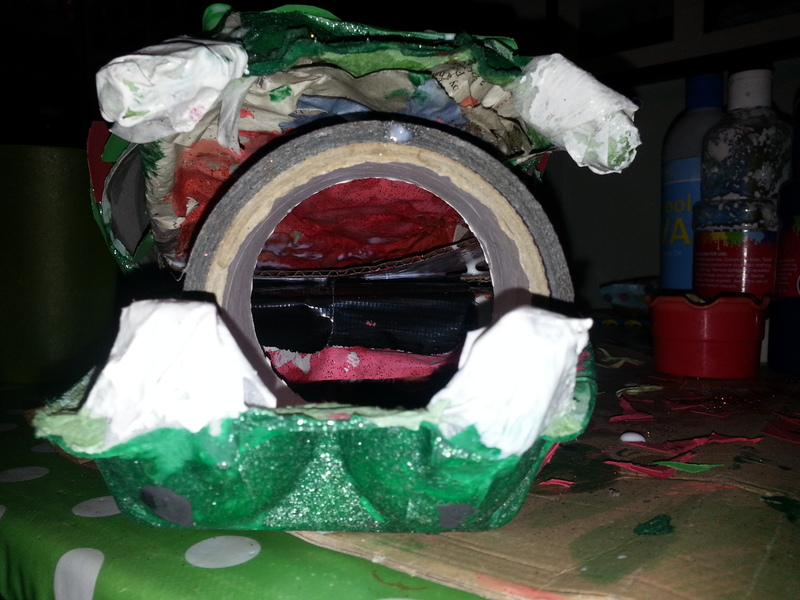 He then soaked scrunched up sheets of newspaper in watered down PVA and packed it into the box. It took four hours in the oven to dry out! The jaw was attached using an eighteen inch long t-shaped strip of heavy duty cardboard from a corrugated cardboard box. This was long enough to go one and a half times round the box. The t-shape was clipped to fit underneath the egg box. One end of the strip was gaffer taped to the roof of the mouth at the back (you can just see this in the picture below, which is upside down). The rest of the card was liberally covered in PVA and then wrapped around the lower jaw. I left it upside down with the gaffer tape and some scissors on it to put pressure in the correct places while it dried. I also added a load more scales to cover up the cardboard used to join the two pieces together.